It's been nearly four years since we visited Madagascar. I fell in love with the country, the wonderful people and of course the wildlife and one day I would love to return. But for much longer and to spend much more time photographing not just the wildlife but also other aspects that make Madagascar so special, creating powerful images to bring their stories, beauty, incredible adaptations and their survival plight to those who may never get the chance to experience it for themselves. I've been going through some old images and come across a few that when first returning home I wasn't so sure about but now they strike me in a completely new way and over the coming months I will be sharing some of these with you along with their stories. I'm often asked why I choose black and white or monochrome over colour for some images and the truth is that when you remove the colour from an image (not all images work) it can become so much more powerful and thought provoking, drawing you into the the story behind it. 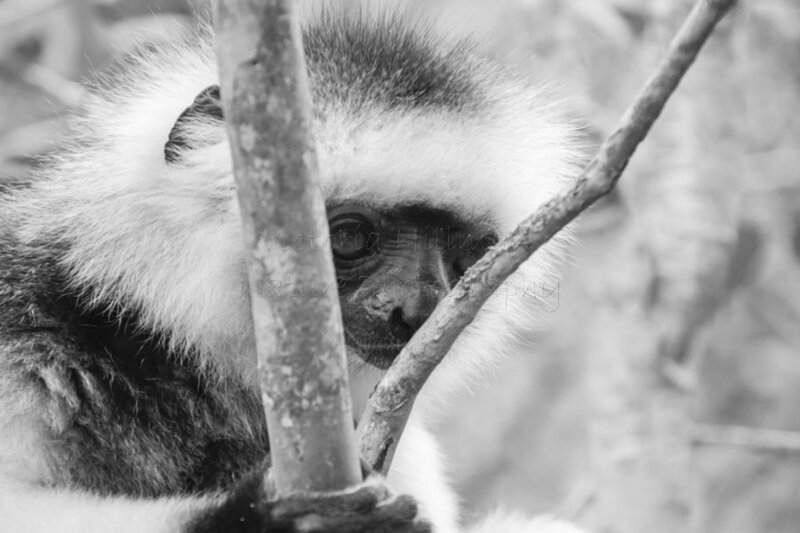 First is a diademed sifaka (Propithecus diadema), one of the many critically endangered species of Madagascar that are declining due to habitat fragmentation and hunting. I don't know what made me take this photo but looking back at it now and having processed it in black and white I find it to be incredibly powerful and thought provoking, looking through the branches at the lemur that is looking down further enhances that feeling.